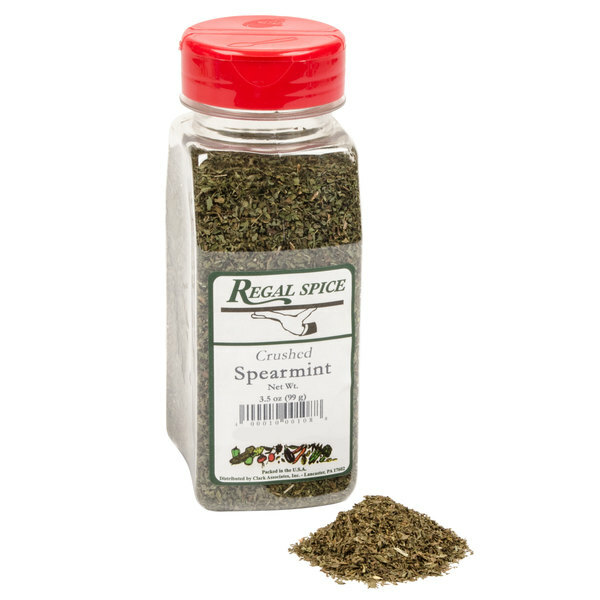 Regal crushed spearmint is a popular ingredient in both sweet and savory dishes. 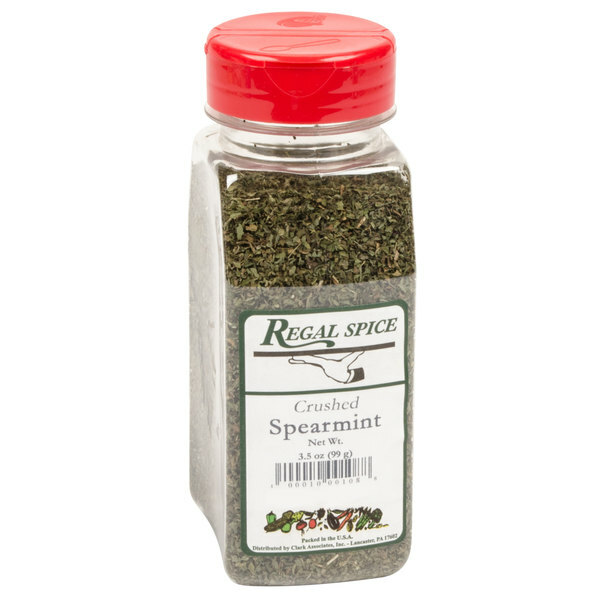 Infuse distinctive flavor into your menu items with Regal crushed spearmint. Pale green in color, these textured leaf flakes impart a refreshing minty flavor on a variety of dishes. 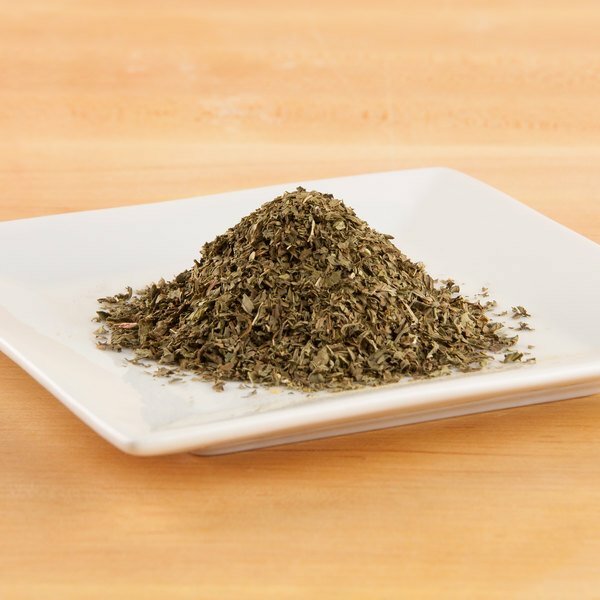 This popular seasoning is derived from the dried, crushed leaves of the spearmint plant. Spearmint is the preferred type of mint used to make the mint sauce or jelly that is the traditional accompaniment to lamb. These crushed leaves are also great for making spearmint tea and other popular minty beverages. 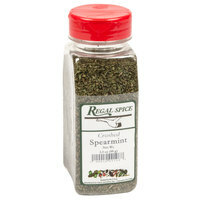 "Spearmint isnt the easiest spice to come across, but Webstaurantstore.com has it and at a very low price!!! Great for spicing up desserts! Add a touch to cream before making whipped cream!!!" To maintain its strong flavor, fresh spearmint leaves were dried to create these delicate flakes. You can crush these leaves before adding them to your dishes, releasing the full aroma and flavor of the herb. Spearmint has a cool, sweet taste that compliments both sweet and savory foods. It's also popularly used in beverages like tea. The most popular type of mint used in recipes, spearmint is commonly paired with tomatoes, meat, fruit dishes, and chocolate. 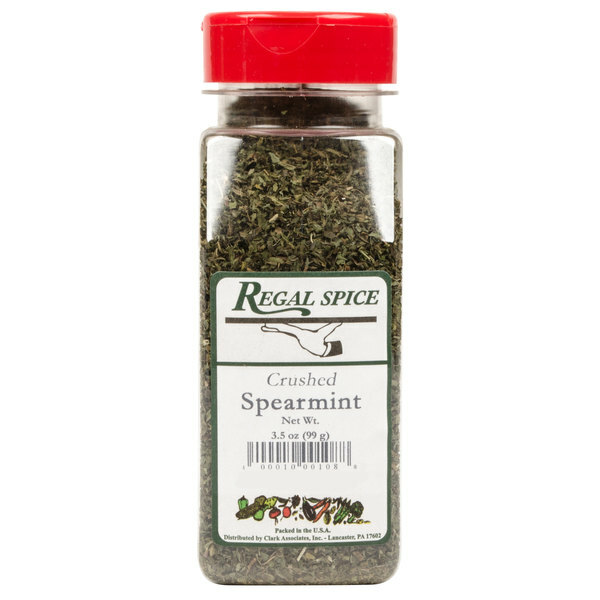 Item #: 10207144 Regal Crushed Spearmint - 3.5 oz. 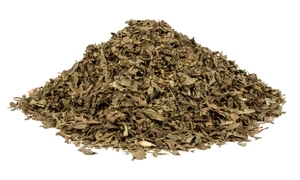 Item #: 102708002 Regal Mint Leaves - 6 oz. Overall User Rating: Regal Crushed Spearmint - 3.5 oz. Great alternative or additive for mint extract. These crushed leaves are a great garnish for specialty desserts and a wonderful additive to herbal teas. Hard to find locally, glad you offer it! I usually buy fresh mint for my iced tea. But i decided to try this because fresh mint doesn’t last very long. Big fan of this!!! Great, aromatic spearmint leaves that are great for specialty dishes. Love the nice, cool taste of these leaves. A great herb to use in teas. 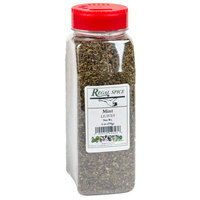 A nice quality spice that is priced perfectly and great for home use. The spearmint is a great minty herb that is great for adding to herbal tea. We are not super experienced using crushed spearmint. However, this spice works great for making mint jelly and fresh mint sauce. If you like mint juleps you can use this spice. Also great for mint tea! Best for frosting, balms and gum pastes but i also shake it up in a Martini shaker and make at home Mojitos, its very delicious! The crushed spearmint smells minty and clean. A great way to spruce up warm green tea to help soothe a sore throat. Also great in our mince pies. This regal crushed spearmint has such a great long lasting freshness. The smell is great. i will definitely be purchasing this item again in the future. This spice smells exactly like mint candy canes. Love this regal spice crushed spearmint. This was a 3.5 oz container and very soft feeling herbs. ive been looking for dried mint everywhere in my local stores .. nobody has it i love this stuff especially on lamb chops !!! and its sooo fresh and so aromatic !! I can get fresh mint but i needed this for recipes, etc. I use spearment in my tea every single morning. I have never seen it elsewhere in any store. Thank you for making it available, Webstraunt. A nice brand of crushed spearmint. It can be hard to find in grocery stores so it is so convenient to buy of this site. I love using them in my cooking. We rarely use spearmint in our restaurant, but we always keep the Regal brand handy. The spearmint is fresh and full of flavor. Smells amazing! Made a nice mint ice tea I just added it to the brew cycle of our automatic tea brewer and that was it. Made for an event and people were happy so I was as well. The Regal Crushed Spearmint seasoning is great. The shelf life is impressive and I would order it again for sure because it is the perfect addition to any fresh fruit dessert dish. I like how easy it is to order and will continue to do so. The fast shipping and quantity discounts are a huge plus. Would highly recommend to any kitchen manager. The Regal Crushed Spearmint is really good in my tea. It taste great and the price is very reasonable. I am very happy with my purchase and highly recommend. This is a great, strong fresh, flavorful spearmint. We use it mostly in baking. It imparts a slight taste, not too over whelming. Great value.